Doors 8:30pm - Show 9pm. 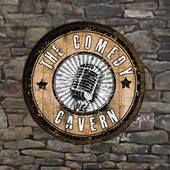 The Comedy Cavern is an alternative Comedy Club, located in Coughlans pub on Douglas Street. Some gigs are open mics, some feature the best of Cork Comedy, we also run "Fringe Interests" nights featuring the best shows from last years Edinburgh Fringe, preview nights where acts try out this years Edinburgh show, and we occasionally have top class professional comics like Joe Rooney and Al Lubel gracing our stage.